The Homewood Suites is located in a quiet neighborhood in Carmel Valley, San Diego. Not only is it located near major highways (namely, I-5, Coastal 101, and I-805) but it is also only a few minutes drive to the ocean. It is nestled between two quaint coastal "towns" of La Jolla and Del Mar, both of which offer numerous dining and shopping choices. 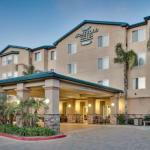 The hotel is perfect for families intending to stay and explore San Diego's many attractions. The two-room suite feature is ideal for families. It was a little tight for my family consisting of 2 adults and 3 kids but it would be just perfect for a smaller family. The room had a fully-equipped kitchen and a dining room. You can prepare your own meals or simply enjoy complimentary breakfast from the hotel. To the business traveler, Homewood Suites also offers free Internet access. The pool is our favorite spot at Homewood. It is a good-sized pool for young children. You can enjoy the hotel brew while watching your kids frolic in the pool. Parking: Yes, there is parking. If the hotel is full, finding a spot can be challenging.